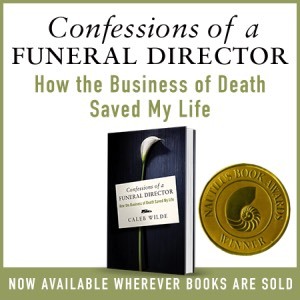 CONFESSIONS OF A FUNERAL DIRECTOR » After the Sandy Hook Shootings: What Happens Next? After the Sandy Hook Shootings: What Happens Next? On Friday, December 14th, Sandy Hook Elementary experienced a tragedy that is creating a new normal for the town of Newtown, Connecticut. The very same day as the school shootings I worked a viewing at a small Mennonite church in Gap, PA. As with most Mennonite churches, the pastor is bi-vocational. This specific pastor works as a part-time pastor and full-time salesman for an agricultural feed company. The area that he covers includes Bart Township, the same area that experienced the Amish school shootings in 2006. This, like all tragedy, finds a life of its own. Friday, December 14th marks the first day of a new normal for Newtown, Connecticut. In many ways, this new normal is a sad birth. In this blog post, I want to look at the practical side of how the next couple days and weeks will look for Newtown. TRAUMA RESPONSE: Thankfully, there are professionals who are being tasked this very moment in setting up response teams. The American Red Cross, various hospice programs and the American Psychological Association all have large scale trauma response teams who are trained to counsel children and parents in psychological and bereavement support, organize support groups and guide the community back to some type of semblance. The response teams will evaluate, support, offer guidance and help as the children, parents and teachers begin this dark journey. Children do grieve. As long as there are relationships formed, there’s grief. And while the general public is not very adept at understanding a child’s ability to grasp death, those from the APA, Red Cross and hospice programs are. All the children will experience traumatic grief (CTG), many will experience post traumatic stress disorder (PTSD) and the hope will be that these children, like the youth from Columbine, will bond together and find deep fellowship in their grief, sorrow and pain. Pragmatic questions like, “When do we restart school?” and “When should I go back to work?” will be guided by these wonderful angels from the response teams. BODY IDENTIFICATION AND FAMILY NOTIFICATION: By deduction, the families know whether or not their son or daughter, husband or wife is dead by the simple fact that they didn’t come home. But, their son or daughter, husband or wife may be so … that the bodies have yet to be identified. Some families may be called into the hospital to visually identify their loved ones, other bodies may be too distorted and will need to be identified through other, more technical means. All the bodies will be studied, some autopsied, some given for organ donation and one – the shooters – will be looked upon with contempt by all who view him. Once identified, the families will start the funeral arrangements. 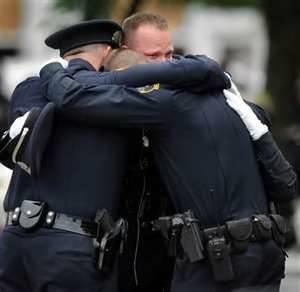 These police were apparently some of the first on the scene of the Newtown shootings. FUNERAL ANNOUNCEMENTS: There’s only one funeral home in Newtown, Connecticut. And while I doubt the Honan Funeral Home will bury all the victims and the shooter, they will probably bury many of them. From what I can tell by the obituary section on their website, the Honan Funeral Home is not a very large funeral home. In fact, they’ve only advertised 12 obituaries in the past year. They will need help as they could very well have twice their yearly volume in one week. And thankfully, per this article, other surrounding funeral directors are offering their help to Honan. Any funeral home and funeral director who works with these families will need their own type of support over the months to come. Most of us don’t enter this business because we’re cold hearted; rather, we enter it because we’re generally big hearted. These tragedies hurt us as well. Embalming the body of an elementary school student that has been autopsied and shot is enough to permanently disturb anyone, including a seasoned funeral director. Questions of “how will this family pay for this funeral?” are likely taken off the table, either by the funeral director’s generosity or by nonprofits like Bury a Child (run by my friend Nancy Burban, who lives in a neighboring town) who are already donating caskets and raising funds for funeral expenses of the children (UPDATE: Per Nancy, all the funds have been raised to cover the funeral expenses of the victims). Police and other first responders will carry a burden that no man or woman should ever carry. They have seen images no one should ever see. Pastors, too, will experience many sleepless nights as they prepare words for an unspeakable event. THE NEAR FUTURE: The funerals will be large, sad and no doubt full of horrible theology explaining how we can’t question God, how God will turn this into good, etc. Yet, despite the horrible theology, many churches will find themselves full. Churches will comfort some families. The community will become more closely knit. Memorials and monuments will be built to honor the memory of the children and the teachers. School will eventually reconvene. On December 14th, 2013 CNN will hold a special marking the one year anniversary of the shootings. And in five years the world will forget. But the pain will linger. The grief will remain in the hearts of the parents and their families. Time will not heal these wounds. This is the new normal for Newtown, Connecticut. This entry was posted by Caleb Wilde on December 15, 2012 at 12:03 am, and is filed under Children and Grief, Death in the News, Death of a Child, Grief, Murder. Follow any responses to this post through RSS 2.0.You can leave a response or trackback from your own site.